Time for your check-up! Doc McStuffins is one of our favorite TV shows. My little guy can’t get enough of Doc’s stuffed dragon Stuffy. If you have a little fan in your home with a birthday coming up, a Doc McStuffins birthday may be the perfect theme! 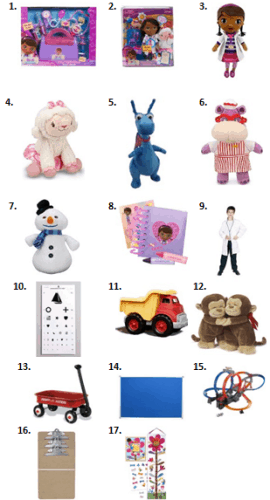 If you love Doc McStuffins, don’t forget to check out our special Doc McStuffins category for even more fun ideas! Here I’ll share some party ideas for invitations, decorations, activities, food, dessert and treat bags. To learn more about Doc McStuffins and her pals, you can visit Disney Junior. 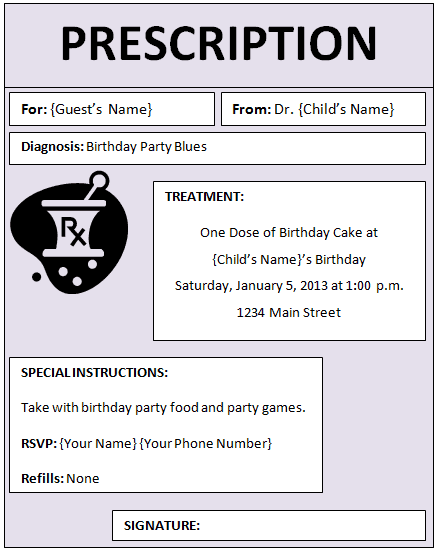 A cute idea for an invitation is to create your own prescription card. Each card could be personalized for each guest with their name at the top as the patient. Their diagnoses – the birthday party blues! Their treatment – one dose of birthday cake of course! Include the instructions of taking the treatment with birthday party food and fun activities. As the official doctor, your child could sign the bottom of each prescription card invitation. Here’s a sample to help inspire your creation. You could include your prescription card invitation on a sparkling purple or pink paper background. Righty-on-Lefty Race: Use a bandana to tie kids legs together at the knees and have them try to race across a finish line. Dump Truck Load: Have the kids race to load the dump truck and then push it around safety cones to the finish line. Time For Your Check-Up: Have the kids race to put together a broken toy or puzzle. A Page for the Big Book of Boo Boos: Provide each child with a few crayons and a piece of paper. Give them a toy diagnosis to draw for the Big Book of Boo Boos. Boo Boo Pictionary: Kids could be asked to draw some popular diagnosis pages from Doc’s Big Book of Boo Boos while their team members try to guess which diagnosis they are drawing. Doc McStuffins likes a lot of pink & purple shimmer so your party dessert could be as simple as iced cupcakes topped pink & purple edible sparkles. Some other fun ideas for dessert include some Chilly snow cones, some Aurora star cookies and Lambie’s ballerina cupcakes. 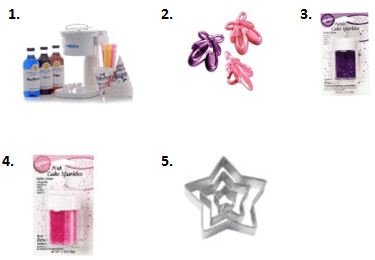 There are quite a few ideas for treat bags for a Doc McStuffins birthday party. Since Doc loves both sparkly pink and purple, you could use a sparkly favor bag. 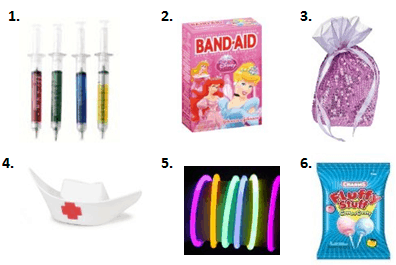 Some fun ideas include injector writing pens, cartoon bandages, “stuffing” (cotton candy), toy doctor tools, a nurses hat and some “Glo-Bo” glow sticks. Who is your favorite character on Doc McStuffins? We’re adding new party ideas all the time! Stay updated on the latest ideas by following along on Facebook, Twitter, Pinterest and Bloglovin’. Disclosure: I am part of the Amazon affiliate program. I am also a part of the Disney Junior Mom program and I receive special perks as part of my affiliation with this group; however, this post is not sponsored. The opinions on this blog are my own. do you have a template for the prescription invite? If you do not mind, can u also send me the template? Absolutely, it’s on the way! Do you mind sending this to me too?? I am so excited for my daughter to see these..
Hi Clarissa! I emailed it over this morning. Please let me know if you didn’t receive it. Have a great party! Could you please send me the template also?! Thank you! Hi Audrina! I just sent it over. Have a fabulous party! Can someone send me the template as well? If possible and you do not mind, could you please email me the template as well? Hi Michelle! I just sent it over this morning. Hi Tay! It’s on the way over right now. I love the invite. Would you please send me the template at your earliest convenience? Hi Kristin! I sent it over a couple of days ago. I hope it made it there! hi do you mind sending me the template also i would really appreciate it great idea!!!! Hello Jordanna! I sent it over yesterday – I hope it made it to you! Can I have Doc template please? Hi Alison! I emailed it over to you. Please let me know if you didn’t receive it. Thank you! Hi! I’ve just sent you the email. Please let me know if you don’t receive it. Hi Yolanda! I sent it over a couple of days ago. Please let me know if you haven’t received it. Thank you! Hi Tiana! Not a problem – glad I could help with your project! Hi Vanessa! I’ve just emailed you the template. Please let me know if you haven’t received it. Thank you! This is amaazing work. May I have a copy sent to my email of this template? Hi Victoria! I emailed you a copy – please let me know if you didn’t receive it. Thank you so much! I love the idea and can’t wait to use it! I love all your ideas! I was wondering of you could please email me your invitation template. Super cute idea! Thanks so much! Hi Brittany! Thank you for your kind words. I’ll send you the template in a few minutes. Please let me know if you don’t receive it. Happy Planning! Love your ideas!! You are extremely talented! Could I also get the template??? You bet! Check your email in about 5 minutes. I hope you have a fabulous party! Hi Natalie! I’ll send you an email with the template right now. Please let me know if you don’t receive it within the next 5 minutes. Happy Planning! I would love the template as well! You betcha – it’s on the way. Let me know if you don’t receive it. I like all your ideas! Is possible to send me the template? You bet – I just sent it over. Please let me know if you don’t receive it. I hope you have a fabulous party! This is so cute. I work in daycare and one of my parents asked to to make invitations. Could i please get the template for this also? Thanks so much!! Absolutely! I’ve just sent over the file. Please let me know if you don’t receive it. I hope the party is fabulous! You bet – it’s on the way over. Please let me know if you don’t receive it. Could you send me the template as well? My daughter really loves this idea thank you. I sent it a few days ago – I hope you received it. Could I get a copy of the template please? You sure can, Lindsey! I will send that over right now. I would love the template as well! So impressed with this idea!! You bet, Amber! I just sent it over. I hope you have a fabulous party! You bet, Amanda! I just sent it over. Please let me know if you don’t receive it. I LOVE the invitation but I was wondering if you can send me a template. This is the theme for my daughters party in October. Thanks for your wonderful ideas!!!! I just sent it over, Keisha! I hope your daughter has a fabulous party! Hi Sessie! I just sent it over. I hope you have a fun party! Hi Ashley! I just sent it over to you. I hope you have a great party! Hi Katie! I sent is over a couple of days ago – please let me know if you didn’t receive it. Thanks & have a fabulous party! Can yu send me the templates that you used as well such cute ideas! Hi Jasmine! I just sent it over – please let me know if it doesn’t come through. I was wondering if u could send me the templete to make rhe invatations please. You bet – I’ll send it over right now. I hope you have a great party! Could you please send me the template for the invitation too please for my daughter’s party? Hi Patricia! I emailed it a while ago (just catching up on replies here) – please let me know if you didn’t receive it. Could you send me a template for the invitation also? I love all of these ideas so cute! Hi Brook! Please let me know if you didn’t receive the emailed template. Have a great party! can you send me the template as well-thank you! Hi Angie! I’ve sent it over. I hope you have a fun party! Thank you so very much for the fantastic ideas!!! Love them all. Like everyone else above, I would love to be able to utilize the template. Can you also send it to me? Thank you for your kind words, Michelle! I hope you have a fabulous party! I sent the template over a few minutes ago – please let me know if you don’t receive it. I would LOVE the template of the invite. I am planning a birthday party for next month. I love your creativity. Thank you for your kind words, Liz! I’ve sent over the template – please let me know if you don’t receive it. Hi Jannea! I just sent it over – please let me know if you don’t receive it. Love this idea, can I possibly get the template as well. Thank you! Hi Miranda! I just emailed the template to you. Please let me know if the email doesn’t make its way over to you. Hi Patrice! I just emailed it over. Please let me know if you don’t receive it. HI! Can you email me the template you used for the above invitation? Thanks in advance. I’m sorry I sent my work email, but can you please send the template to the email above. THANKS. Hi Brittany! I sent it over this evening. Please let me know if you don’t receive it. Hi Heather! I sent it over this evening. Please let me know if you don’t receive it. Yes, I’ll email it to you right now. I came across your website looking for Doc McStuffins ideas and such. And I was wondering if I could get the prescription invitation sent to me as well. It is so cute! I would love a copy of the invite template please? And thank you! Hi Ashley! I’ll send it over right now, please let me know if you don’t receive it. I love these ideas! Do you mind sending me the template as well? You bet, Samantha. It’s on the way! Hi! I would love to use the Doc McStuffins invitation template for my daughter’s birthday in a few weeks. Can you send that to me, please?? Thank you! Hi Crystol! I emailed it over on January 4th. I hope you received it. Have a great party! could you please send me the template also I would love to use it for my daughters birthday! thank you so much! Hi Tracy! It’s on the way! Will you please send me a copy of the prescription template for the birthday invitation? THANK YOU! You bet, Kim! It’s on the way. I really like the invite I have been trying to create it but can’t. May I please get a copy of the template. Hello Camellia! I emailed it over on January 17th. Please let me know if you need me to resend it. Thank you! Hi Kristy! I emailed it over on January 17th. Please let me know if you didn’t receive it. Have a great party! Hi Tonia! I just emailed it over to you! Hi Courtney! I sent it over last night. Please let me know if you didn’t receive it. Hi Cheryl, Could you please send me a template also? Thanks in advance, This is a Great idea!!! You are truly helping a lot of moms and may God Bless you!!! This is awesome. Thank you so much for all the ideas, you are so creative. Can you also send me the template so I can print some invites up? THank you in advance. Hi Monica! Thank you for your sweet note. I just sent the template over to you via email. Thank you so much for your kind words! I just emailed the invitation over to you. Have a great party! Your template seems to be very popular. Could you email it to me as well? My daughter is a big fan! Thanks! Absolutely! I just sent it over to you. Have a great party! Hi Kristin! I sent it over a couple of days ago. Please let me know if you didn’t receive it. Very cute idea for invite – would you please send me the template. Hi Kathy! I just emailed it over to you. Thanks for stopping by and good lucky with the party planning! Hi Sierra! Yes, I’ll send it over to you through email right now. Hi, could you email me the template of the invite please 🙂 Thank you! My email is brittinipeters@yahoo.com THANK YOU! Hi! I love your ideas! Could you send me the template too? It is ADORABLE! Thank you for your kind words, Mary! I just emailed it over to you. Hey I was wondering if I could get the template as well. my daughters 4th is coming up and she is obsessed with them!! Could you send me the template, please? It is adorable and perfect! Absolutely, Theresa! I just sent it over. Have a great party! Hi! I love your creativity! Could you also send me the invitation template? Hi Katie! I just emailed it over to you. Thank you for your kind comment and I hope you have a great party! Hi Cheryl! Thank you! That was fast and it’s perfect! I sure can! I hope you have a great party. What wonderful ideas! Would it be possible to send me the template too? Thank you! Hi Stephanie! I just sent it over. could you send me the template? It looks great! Hi Kristin! I just sent it over. Have a great party! Hello! I just send it over to you. Have a great party! Hello! I just sent it over to you this morning. Have a great party! Hi Jennifer! I just send it over this morning. Hi Natalie – I emailed it over this morning. hi i was wondering if you can send me a template of the invitation please. Hi Jasmine – I emailed it over this morning. Hi Tiffany! I’ve just sent it over. I hope you have a great party! Hi Sarah! I sent it over this afternoon. Please let me know if you didn’t receive it. May I have the template as well? I’m doing this theme for my daughter birthday this month. I like all your ideas! Could you please send me the template too? I am planning a party for my daughter in the end of May. Hi! I sent it over this morning. Hi Dora! I emailed it over this morning. I love the ideas! Could you possibly send the invitation template my way as well? Hi Stephanie! I tried to email it to you this morning but the email was sent back as undeliverable. Could you please try to message me your email address? Thank you! Hmm..not sure why it didn’t work! misstcher@yahoo.com Hopefully, it’ll work this time! Hi Loretta! I sent it over to you this morning. I sure can! I’ll send it over right now. I love this! My daughter is having a Doc Mcstuffins birthday and these ideas are perfect! Would you mind sending me the template as well? Thank you! Absolutely, Tiffany! I sent it over to you yesterday! Hello, I absolutely love the invitation!!! Could you send me the template. Thanks in advance!! Hello Ann! I just emailed it over to you. I sure can, Tiffany! I just sent it over last night. Hi Jennie! I emailed you last night. Please let me know if you didn’t receive it. Hi Jasmine! I emailed it through yesterday. Please let me know if it doesn’t arrive. Hi Latonia! I’ve emailed you the invitation. I hope you have a great party! Hey 🙂 can you please send me the invitation template!!! Thank you so much!!!! Hi Becky! I send it through today. Please let me know if you don’t receive it. Hi! I was wondering if I could use the template for my daughter’s 4th birthday party. Thanks!! Hi Vanessa! I just emailed it over to you. Hi could you send me the template for the invitation and anything else you used please? Hello! I emailed the invite over a few days ago. Please let me know if you didn’t receive it. Hi – I am having a 3rd Birthday Party for my daughter and would LOVE if you could send me your template. Thank you Cheryl – you are awesome! Love your ideas!! Can you please send me the template as well? Hi Rhonda! I emailed it through a couple of days ago. Please let me know if you didn’t receive it. Hi Emani! I just emailed it through to you. I love these invites, if you dont mind could you please send me the template also? Hi Ashley! I just send it over this morning. Thank you! could you please send me the invite template as well. Hi Terry! I sent it this morning. Please let me know if it doesn’t arrive. Ok so Im TOTALLY in live with ALL your ideas! Please semd this template over!!!! It is the ABSOLUTE CUTEST!!!!!! Hi Candace! Thank you so much for your kind words. I’ve just emailed the template over. Hi Amanda! I sent it over a couple of days ago but I forgot to respond here. Please let me know if you didn’t receive it. What great ideas!!! May I please get the template? Thanks in advance! Thank you, Erin! The invite template is on the way over! Hi. Can you please send me the template for the invitation. Hi Brittany! I just sent it over – happy planning! Could you please email the invitation template also? I love this idea! Hi Roshelle! I emailed it yesterday. Please let me know if you didn’t receive it. Thank you! Hi, Can you please send me a template of the invite? I love it! Hi Joycelyn! I’ve emailed it over to you. Please let me know if it didn’t arrive. I didnt receive the template. Hi Joycelyn! I resent it this afternoon – I hope it made its’ way over to you. Have you checked your spam/junk folder to see if it went there by accident? Please let me know if it didn’t arrive. Can I please get the invitation template and if you have a favor box template I would like that as well. Hi Patricia! I sent the email last night. Please let me know if you didn’t receive it. Hi! Can you please send me the template too 🙂 thank you!! Hi Lisa! I sent it over yesterday. Please let me know if you didn’t receive it. can I have the template sent to me as well? Thank You! Hi Meighan! I’ve sent it over! Can I please get the template for the party invite? Hi Gina! I just sent it over. Please let me know if you don’t receive it. Can you please send me the template? I would greatly appreciate it, as I have already started to use all the other ideas you gave!! Thank you soo much!!! Hello! I sent it over this afternoon – please let me know if you didn’t receive it. Hello can u please send this to me also super cute i love it! Hi Heather! I’ve sent you an email, please let me know if you don’t receive it. can someone please send me the template for the prescription invites? Hi Ashley! I sent it a couple of days ago. Please let me know if it didn’t arrive. Hi Melissa! I sent it a couple of days ago. Please let me know if it didn’t arrive. I was wondering if I could use the template for the prescription invites as well. Hi Tisha! I emailed it over on the 14th. Please let me know if you didn’t receive it. Hi Tatiana! I just emailed it over. hello!!! These are precious invitations! May I have the template for my daughters birthday party?! Hi Azalia! I’ve emailed the template over to you. Please let me know if you don’t receive it. Hi Donna! I just sent it over – please let me know if it doesn’t arrive. Hi Taylor! I tried to email you last night but the email was returned saying your email address isn’t valid. Can you please send me your email address again? Thank you! Hi Taylor: The first time you commented, your email address was missing a letter. I’ve just resent with the revised email address you’ve included here. Please let me know if you don’t receive the template. AMAZING invitation. I would LOVE a copy of the template too please. & Bless you for begin so generous! Hi Ashley! I’ve just sent it over. I hope you have a fabulous party! Hi !! Could you send it to me as well please? Hi Katie! I sent it over a couple of days ago. Please let me know if it didn’t arrive. Thank you! Hi Judy! I emailed it earlier this morning. Please let me know if it didn’t arrive. Hi Ashley! I just sent it over to you. Have a great party! Hello Goldie! I emailed it over a few days ago. Please let me know if you didn’t receive it. Hi Cheryl. I loved the ideas that you shared. Do you have any more ideas for the food? I saw your invitations on Pinterest site and they are cute. I noticed that people asked about the template. How does it work when you send it to them? Any special program needed? Any other ideas on cute favors? Thank you for your time. The template is in a MS Word version so you simply type on it to personalize it for your party. If you’d like me to email it to you, please let me know. Hi Lisa! I sent it over this evening. Please let me know if it doesn’t arrive. Hi Brittany! I emailed it a couple of days ago. Please let me know if it didn’t arrive. Hi Laura! I emailed it a couple of days ago. Please let me know if it didn’t arrive. Hi I want to do the party for my granddaughter can you please send me the template for the prescription if you can thank you . Hi Myrna! I emailed it yesterday, please let me know if you don’t receive it. Hi Myrna! I resent on the 21st. Please let me know if it didn’t arrive. Hi Cheryl…love the prescription invite. Could you please be so kind and forward me the template as well. Thank you for all the lovely ideas. Hi Aneesa! I’ve sent you an email. Please let me know if you didn’t receive it. Have a great party! Hello! I emailed it yesterday. Please let me know if it didn’t arrive. Can I get a copy of invite template too please and thank you?! Such fun party ideas for a Doc McStuffins theme! Could I get a copy of the invite template please? Thank you! Hey could you also send me the template of the invite please. I love it. Greeting could you please, email the template of the invite. Hi Tristan! I’ve emailed you a copy. Please let me know if you haven’t received it. I would love a copy of the invitation template please! I hope you are still sharing! Hi Erin! Absolutely! I just sent you an email with the template. Please let me know if you don’t receive it. I am playing a party for my 3 year old and would love a copy of the invitation template. Hi Cherie! I’ve sent you an email, please let me know if you haven’t received it. Hi Tiffanie! I emailed these to you a few days ago. Please let me know if you didn’t receive the email. Thank you! Can someone please email me this template? My daughters party is in a few weeks and this would be perfect!!!!! Hello Martina! I’ve sent you an email – please let me know if you didn’t receive it. Thank you! Hello,this is a GREAT idea for my baby’s birthday party !!! Could you send me this template please !!!! Hi Ashley! I sent it over a few days ago. Please let me know if you haven’t received it. Thank you! Hi Sonya! I’ve sent you an email. Do you still have the prescription template available? Hi Shawndra! I tried to email it to you but the email is bouncing back as undeliverable. Can you please email me at cheryl@momsandmunchkins.ca? Thank you!